One in a million time, I would never imagine myself to be as I am today. Guess that million time is over. And now I am the way I am today. It was on one of those blue sky Summer days. Where I had decided to get some crazy activities to do. It’s not hard for me to get ideas since this world had a lot of it. 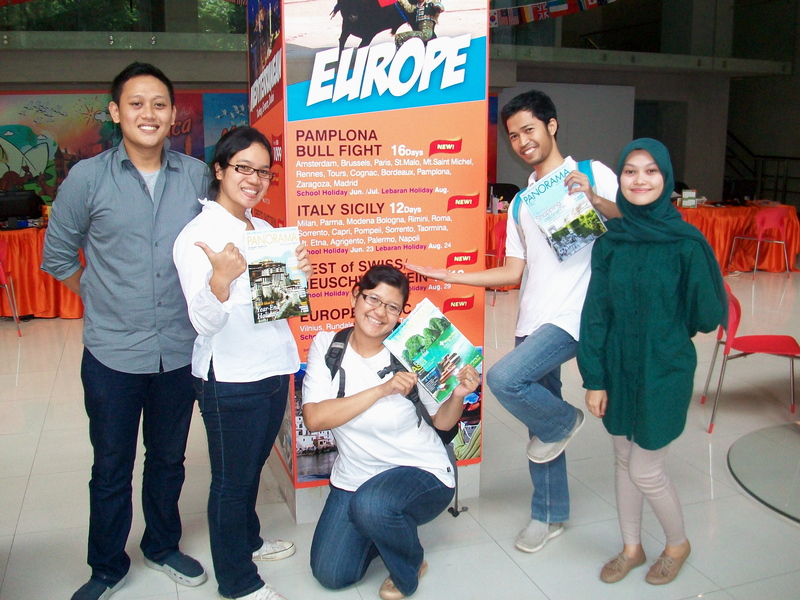 This time I logged into facebook and said I will attend this race organized by Couchsurfing Indonesia. I actually am a newbie in this couch surfing experience. But I am always open to have new friends as well as new experiences. So when one of my friends introduced me to this organization I did not hesitate whatsoever to join it. And I am so grateful I did that. It was my third experience with CS. I did not give much thought about the event actually. They invited me to join the event through fecebook event application. Since it will be done on my Summer holiday, I just said yes. Lucky me, I was teamed up with my CS acquaintance whom I knew from the first CS event. His name is Rheden Dhiba. 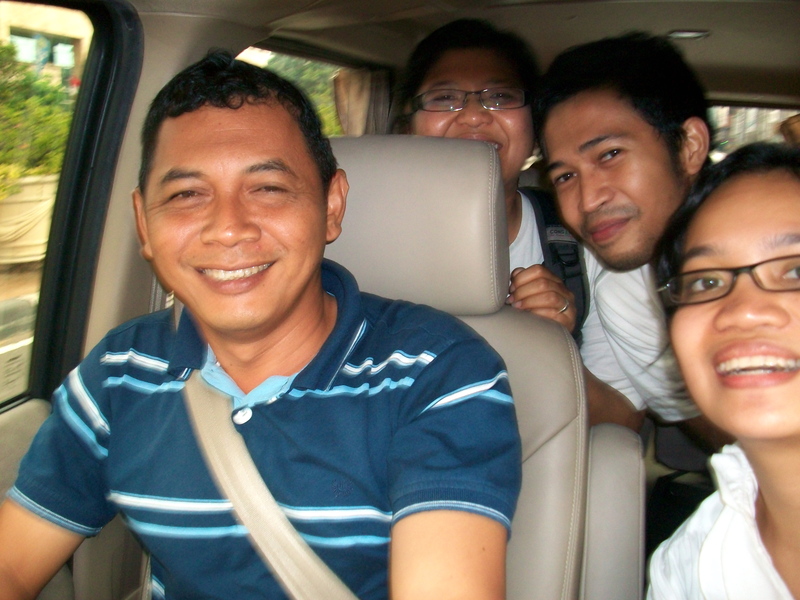 We met at a rafting CS event back then in Sukabumi. We needed to teamed with others because one of original team members was not present at the meet and greet afternoon. 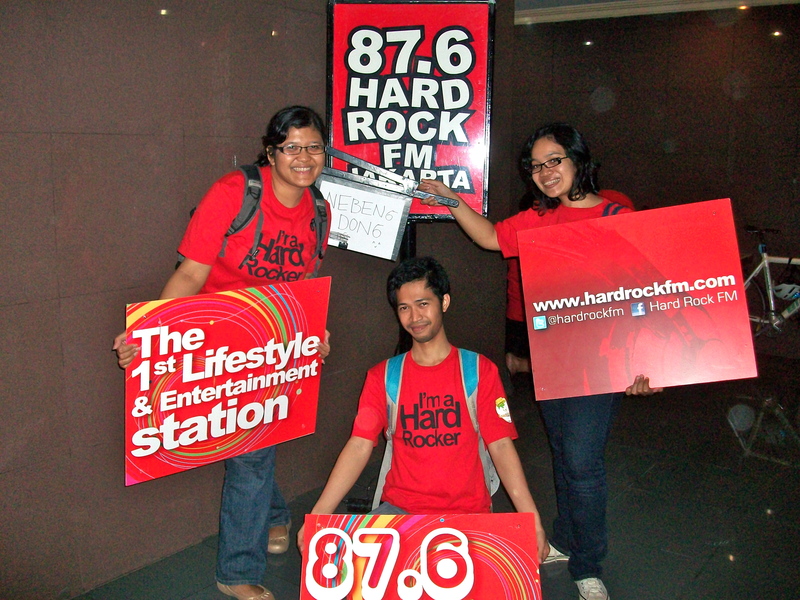 Rheden whom at that time brought his friend along, suggested that we teamed up with her, Jil Helga. I had no hesitation at all. I thought, if he knew her, it will be just great. So we did. We sat together and prepared for tomorrow’s adventure. And it was a hell of an adventure. It was a bit somehow similar with The Amazing Race reality show, but it was not. 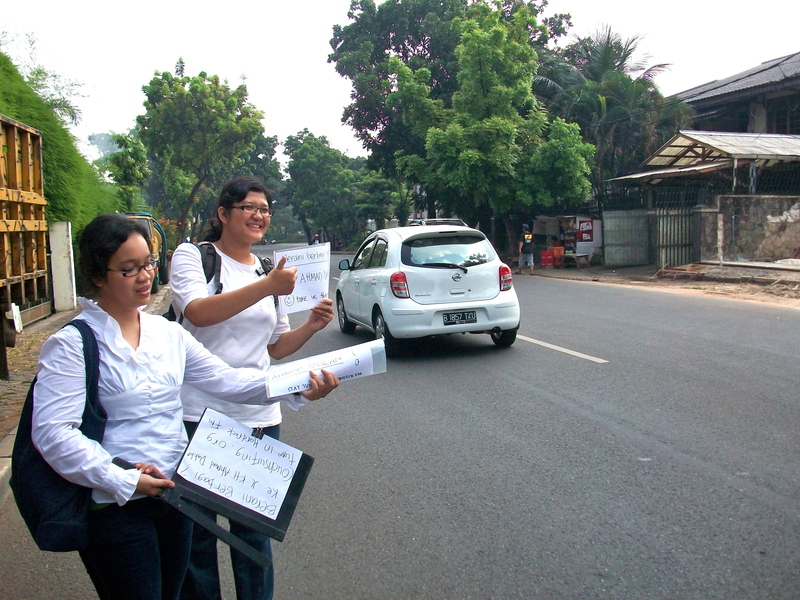 In this race, all contestant needed to go to a designated place around Jakarta. The unique thing was that we were not allowed to get any public transportation, we were to hitch hike cars to get there. Well, Rheden had one experience about it. But my experience was as far as a movie could show. 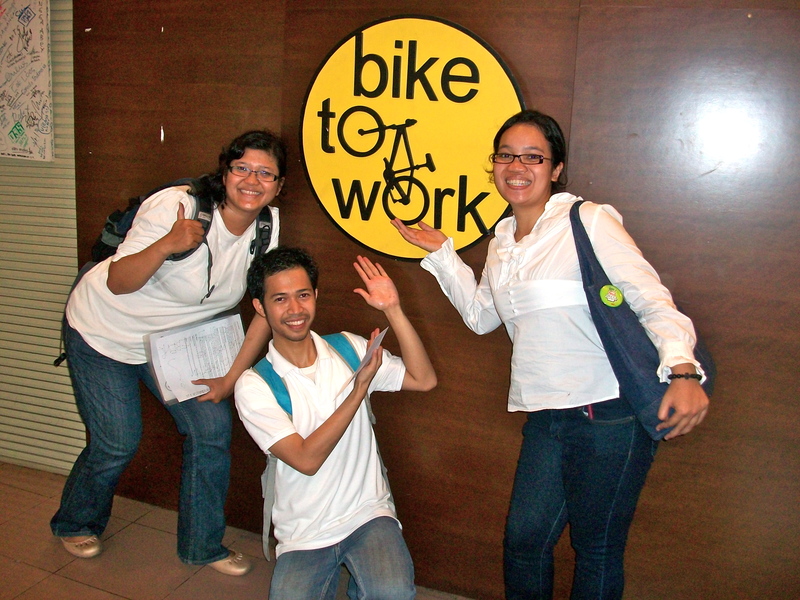 The first pit stop was located in South Jakarta. It was a community house of Bike To Work. I had not idea where it was and neither did my friends. From the address, Rheden noticed some useful directions. 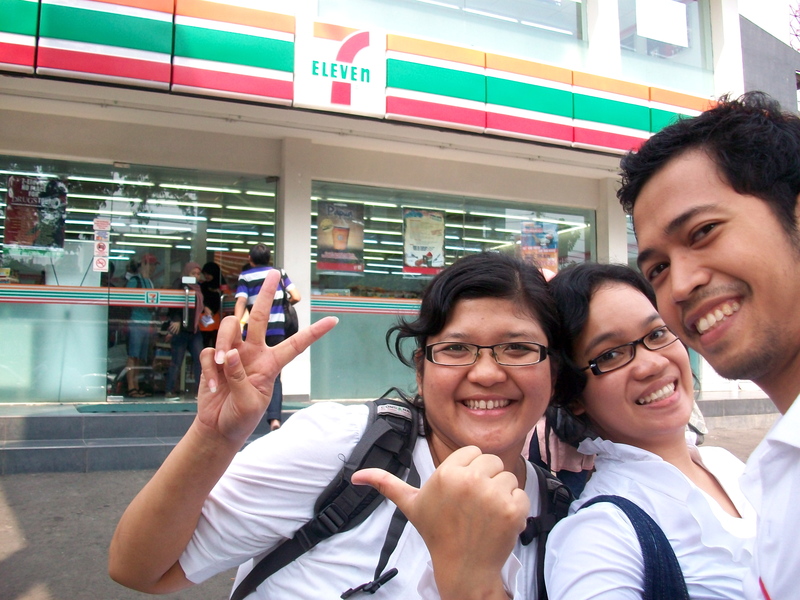 We had our first shot with the official partner, 7 eleven and tried our luck to hitch hike a car. No luck. We had to walk under the Sun for an half an hour or more. We were so new in this hitch hike thing. We didn’t know how and where to do it. After half an hour of unsuccessful attempt, to our disgust, we saw other group who was teamed up with two foreigner can hitch a car easily. Dang! Indonesian people were so blatantly racist! 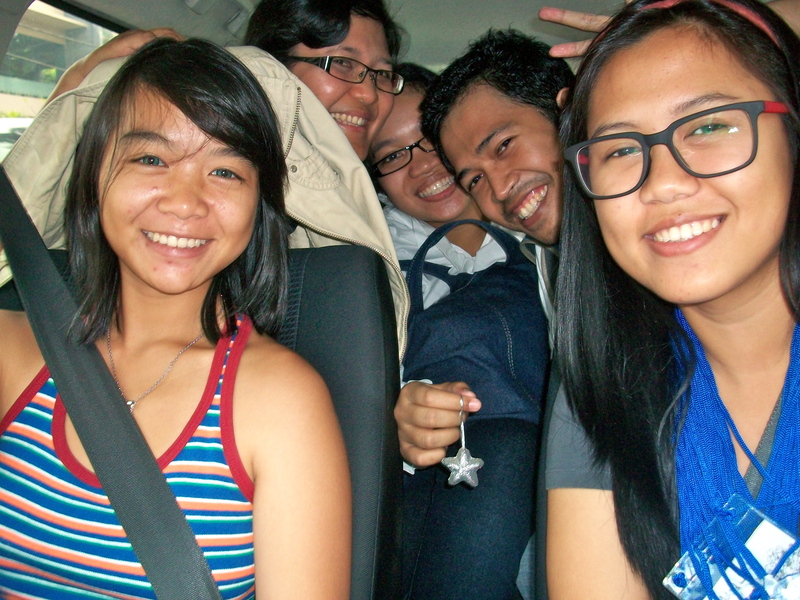 We kept on encouraging ourselves and had a Honda Jazz ride. They were two high schoolers. Yup, Indonesian high schoolers ride Honda Jazz. Then, the next thing we knew, we were there at our first pit stop. The road block was devastating. We needed to fold the bike. Thankfully, they managed to give us some tips. Before we stroke in a horror of the next pit stop clue. We read the clue carefully and in disbelief. 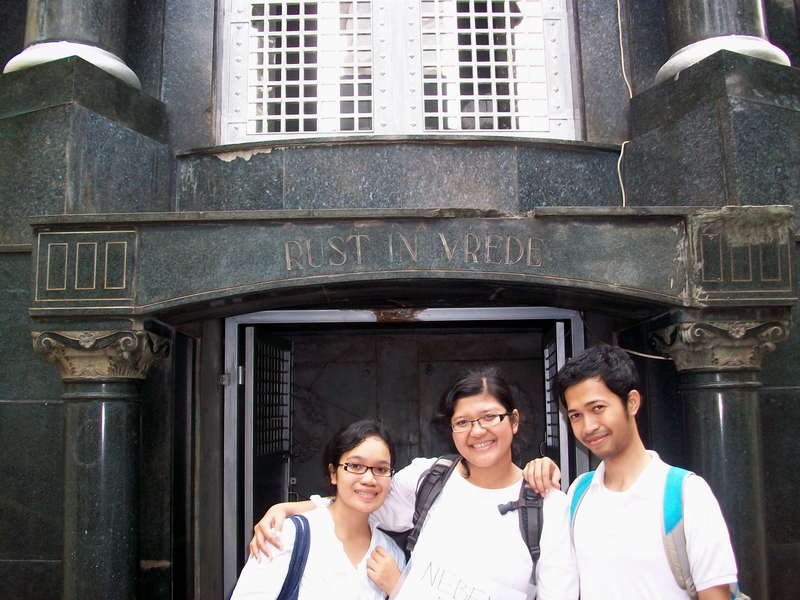 The second pit stop was a Mausoleum located in west Jakarta. I knew that because I stayed in west Jakarta. 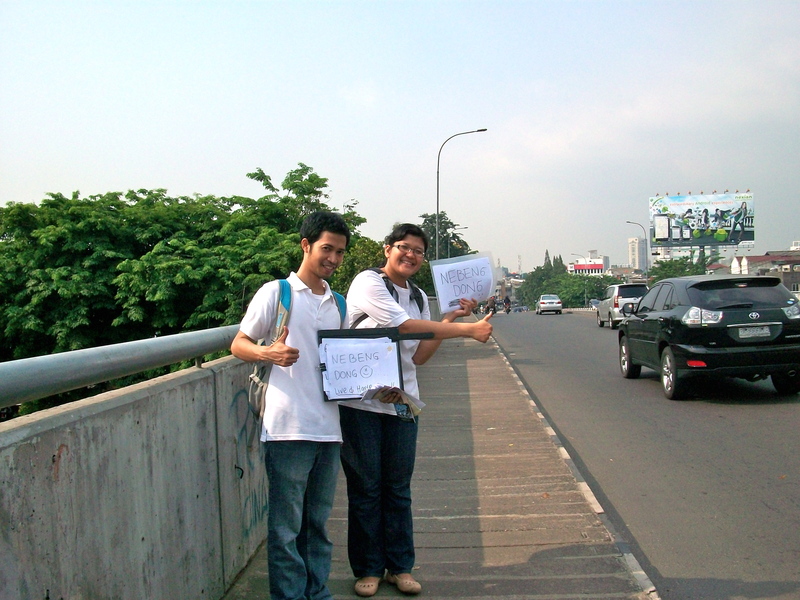 We rushed to hitch hike any car that at least brought us to central Jakarta from which we assumed will be easier. We managed to get a middle age woman on her way to work. Then, we stopped a mother with two kids inside where we squeezed ourselves in. Then we were so lucky to meet a college guy on his way to campus. The city was not friendly to us. People were becoming even individualistic and ignorant. blah! Seriously, we almost gave up. Until we met a man in his early 40, I think, on his way to the airport. Lucky us, he was not in hurry. So, he really took us there, to the cemetery. The Mausoleum was nice. I didn’t know until that day, that we had one here. We had a little trouble to get to the third pit stop. We got another young aged male who was on his way to the airport. And at one of the traffic light we met two gentlemen heading to our course, the Panoroma building of Panorama Tours. Finishing the road block was another thing. At that very moment, I knew that my friends there were fighters. Jill was! I was so thankful to be in the group. What brought us into anxiety was that we finally realized that we were in a competition. And the first to get to the Finish line might be the winner. Jakarta after work period was disaster in a matter of traffic jam, let alone hitching a ride. We had to walk quite hundreds meters before a very fine gentleman in his Nissan lifted us. Wow. It was quite a ride. After such a tiring afternoon, our last car was a fancy car. We talked and chatted with some last power we got. Glancing at the traffic, we just felt so good to be in that car. We tried to forget about the race. We just wanted to be in the finish line fashionably, with a Nissan. Hehehe… When we finally got there, we rushed to meet CS officials. We got the red shirt and got our group photos. We were the 2nd place to get the finish line. Awesome!!! Bow, we didn’t see that coming. As we waited from other groups coming, we got to know the first winner, exchanging the experience and shame and laughters and exhaustion. Hell, that was a great adventure. We had late lunch together before we headed for some night out with the whole pack. Just to get to know CS more. It was great and fun. One experience that everyone should have in their live. seriously! Now, these were the girls who gave us the first lift. We really appreciated them. Without the first kick, we will never have the courage and willingness to continue the race. Sometimes in life, we could never figure out what can or can not we do. One of the things that we never knew before was our ability to be able to survive under the strikingly hot Sun of Jakarta, trying to hitch hike rides. Things that we dare not to do, actually can be so fun to do. Let’s challenge everyone to be not indifferent anymore. Some people in Jakarta, despite their reasons, not only open their car doors but also open their heart by giving a lift for people in need. There’s actually a spark of hope for humankind. Where we risked ourselves to trust others and when we risked others to trust us.